Chandigarh University host State Level Workshop on Virtual Labs. As you know, good lab facilities and updated lab experiments are critical for any engineering college. Physical distances and the limited availability of resources often put restrictions on conducting experiments especially, when they involve sophisticated instruments. Virtual Labs, a Mission Project developed under the aegis of National Mission on Education through ICT (NMEICT), MHRD, Govt of India have been designed to provide remote access to Labs in various disciplines of Science and Engineering. These Virtual Labs cater to students at the undergraduate level, postgraduate level as well as research scholars. Virtual Labs enable the students to learn at their own pace and enthuse them to conduct experiments. Virtual Labs also provide a complete learning management system where the students can avail various tools for learning, including additional web-resources, video-lectures, animated demonstration, and self-evaluation. 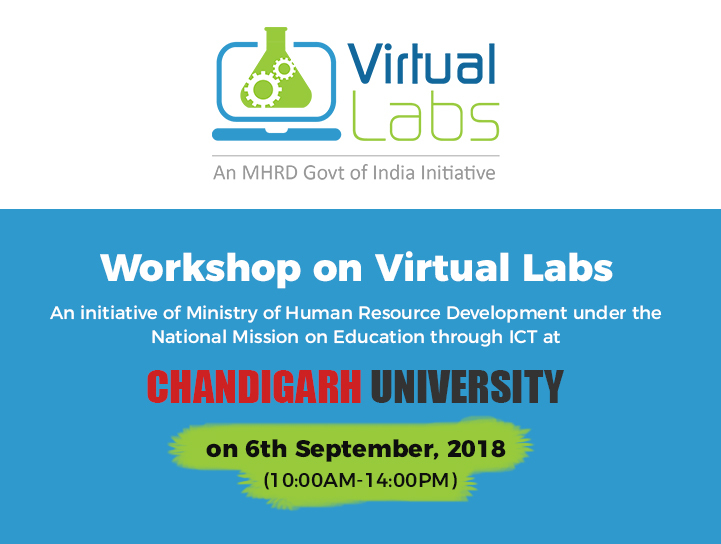 We are very obliged to invite you to attend a free workshop on Virtual Labs at University Institute of Engineering, Chandigarh University, Mohali on September 6, 2018 [Thursday]. You may also nominate faculty members from the respective departments i.e ( ECE / EE / CSE / IT / ME / APP SCIENCES ). The candidate should be a Faculty/ Research Scholar of department of ECE / EE / CSE / IT / ME / APP SCIENCES. 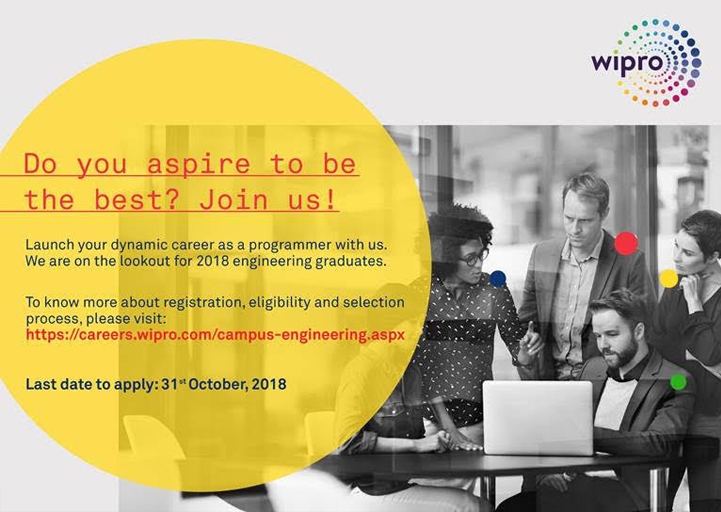 Invitation to a Joint Campus Placement Drive by Wipro Limited at Chandigarh University Gharuan. 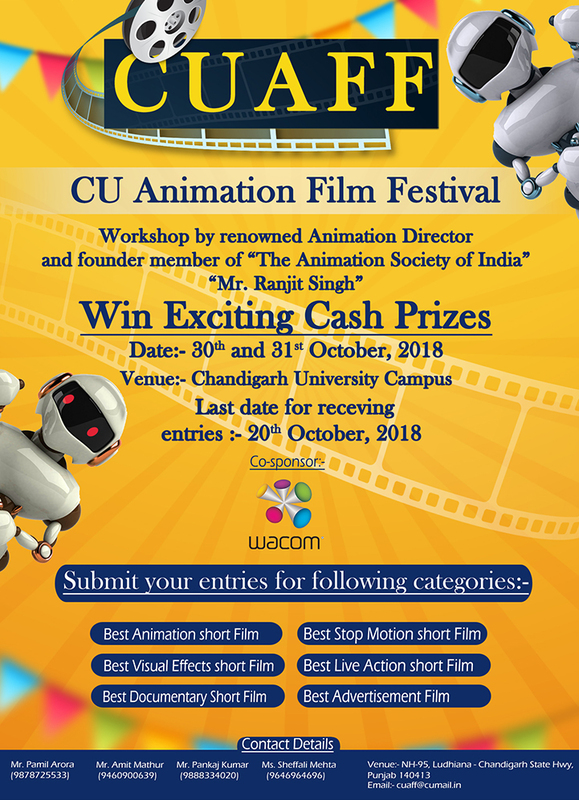 Chandigarh University Animation Film Festival.